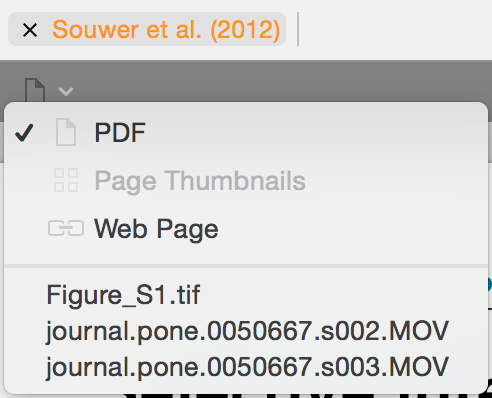 Double-click on a paper in your main library to open it it in the PDF reader screen. If you select multiple papers and double-click, all selected papers are opened in separate tabs in the reader mode where you can easily rearrange the tab order by drag and drop. You can also open imported search results directly from the Search screen by double-clicking or by clicking on the Open button in the Inspector. Click on an arrow on the bottom right corner of the inspector to hide the inspector. To show the inspector again, click on the same arrow again and the inspector is shown again. You can close a PDF that is in the hidden tab by selecting the tab so that you can see the PDF in the reader and then using the shift + cmd + W keyboard shortcut to close the tab. If you would like to open the same papers in the reader tabs that you had open last time before you closed Papers, go to File > 'Reopen Reader Tabs From Last Session'. In addition you can set Papers to always open tabs from the last session in the preferences.